In case you haven’t noticed, the Music Row landscape is changing. Among the notable happenings is the renaming of Demonbreun Hill, a branding initiative by Nashville-based Elmington Capitol Group (ECG) which purchased the Demonbruen strip for $18 million in 2013, in addition to parcels housing Off Broadway, First Citizens Bank and Tin Roof. 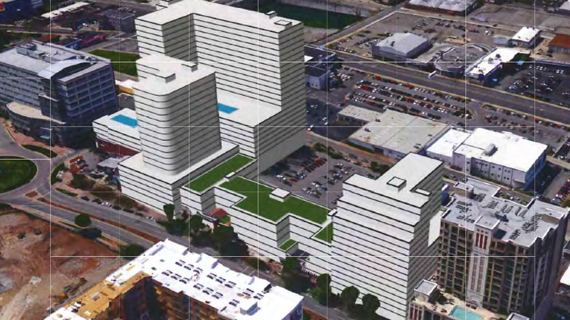 Over the next decade, ECG aims to replace the buildings at the corner of McGavock Street and 16th Avenue with the likes of a 22-story structure, which would anchor a larger development. 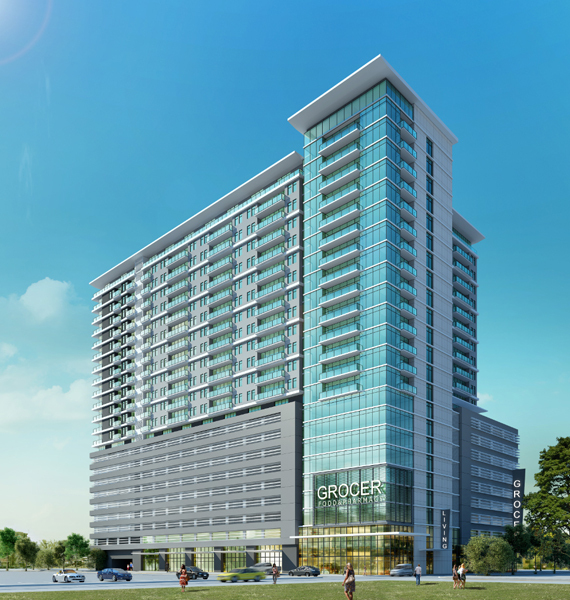 The development would include a grocery and pharmacy, hotel, retail, office and residential space, and parking garage. The project is in the early conceptual phases and goes before the Metro Planning Commission tomorrow (May 28). ECG released new renderings of how the development could be arranged, based on designs from Dallas-based Humphreys & Partners Architects and Kimley Horn and Associates Inc.
To see what the Demonbruen strip looked like in 1999, scroll down for a photo by late photographer Alan Mayor. Deserted Demonbreun. Photo: Alan Mayor, 1999.